A popular brewery that is also a sightseeing spot. the third chief brewer Misa Kawaishi. The food and drink department of our business, which focuses on the theme of "harmony between sake and food", was started about 20 years ago by our current president, who believes in the strategy of "quality over quantity" as the best method of survival for Japanese sake. After receiving good feedback, we opened the restaurant in 1997. It has since become very popular as a sightseeing destination, due to the nostalgia of the sake brewery tours and the healthy food options. 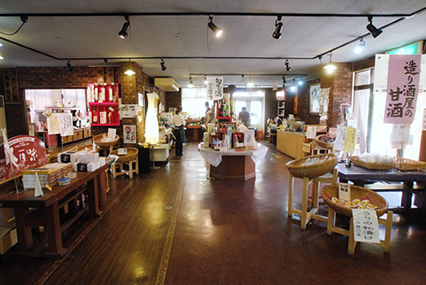 There is even a storefront where you can enjoy shopping for products from the brewery. 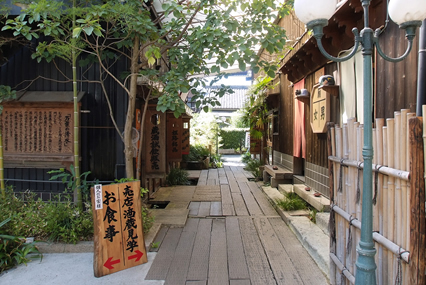 Places like ours, which has several buildings still on the sake brewery premises, are very rare indeed. Customers can take a tour of a few of the buildings, and can see tools that were used until the late 1950's, and also be introduced to our current head sake brewer. In recent years, we have had visitors from all over the country. There are lots of different places to eat in Himeji. The expansive brewery grounds has a newly established tofu restaurant. It is used for many different objectives. Besides our brewery's restaurant Maegura, which specializes in suminabe and tofu, there are also three other restaurants to choose from in front of Himeji Station in the heart of the city. There is the Himeji oden shop Nadagiku Kappatei, the kushiage and shabushabu specialty restaurant Kura, and the French style Ginjo. Wherever you go, they all have an abundant lineup that allows for the ultimate enjoyment of Japanese sake with your meal. "French food and Japanese sake?" you are probably wondering, but GINJYO opened its doors about 20 years ago with its own unique blend of French food and Japanese sake. It was a novel style for the time, but now it is a local establishment and everybody enjoys going there. It is not only a place for people who regularly enjoy sake either, but also a place for young, inexperienced drinkers to enjoy different types of sake. It is definitely a worthwhile place to check out. What are the necessities for sake brewing? 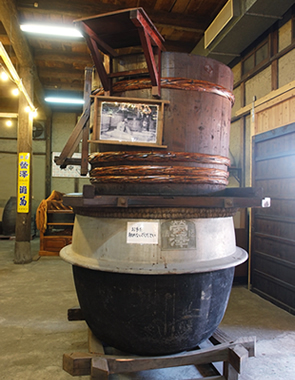 used in sake being displayed on brewery tour. I am the current president's third daughter, and I studied brewing at Tokyo University of Agriculture before returning home. For a long time, I also studied under a chief sake brewer who came to us from southern Japan, and since 2004, I have worked as our chief brewer, when our company began using the chief brewer system. In order to manufacture a local sake, you not only have to be particular in your use of local rice, water, and other ingredients, but you also have to make sure the employees are locals, because it is important to have people who understand the local features and climate. Another thing about us is that the amount of sake we produce is very small. In terms of product, we produce about one-sixth the normal quantity. 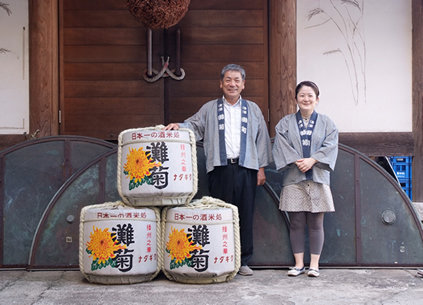 Because the business operates on a small scale, it means we can do everything by hand, enjoying the process of sake brewing with all five of our senses, and preparing it with careful precision. Not doing mass production also has the added bonus of allowing us to develop products in response to customer's needs. Previously, upon a customer's request, we have used local kodaimai rice from the town of Yumesaki and created a pink sake. Because it was just right for use in the early spring Doll's Festival, everyone was really pleased with the results. Using local rice is another important factor to our business. To really understand the meaning of the words "local brew," I feel it is very important to use local rice. Yamada Nishiki rice has become the most widely used rice for high quality sake, but even though there is a production center for it in Harima, it is very difficult for sake breweries to obtain at the present time. Because of the situation, I have been working together with local farmers on an initiative to cultivate and use Hyogo Yume Nishiki rice instead. I feel very strongly that I want to be able to grow and develop our rice and our products together. In this industry, it is rare for a woman to be the chief brewer. lined up. There are also sweets that were made with Japanese sake. Personally, as a woman, it is not something I really focus on, but the image of a true sake artisan is often that of an old man, so I am always happy to receive messages from visitors. The saying "A harmonious brew is good sake" is really important to me. It means that if the workers of the brewery are not satisfied, then it is impossible to make good sake, and I have found this to be very true. Sake brewing is hard work, because we make it by hand in extremely cold conditions. Since it is both physically and emotionally tiresome, everybody has to work as one, and it is my job to build up their spirits. It really is mysterious how the feelings of the workers can influence the taste of the sake. As the chief sake brewer of Harima, I hope to continue keep the harmony among the workers, and among the local sake breweries, so that we can continue making delicious sake that all our visitors will enjoy.